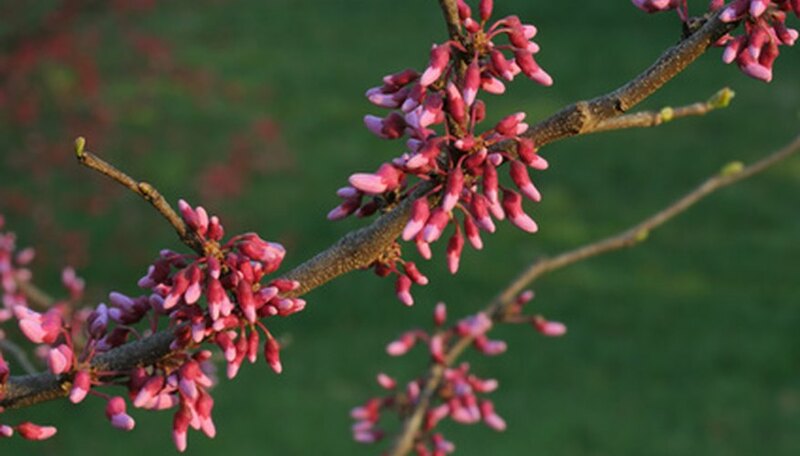 Redbud trees (Cercis canadensis) are susceptible to a variety of leaf diseases. Understanding which leaf diseases affect your redbud tree leaves, what symptoms to look for and how to control the disease will provide you with a method for keeping your tree vigorous and more likely to resist attack. Keep trees pruned of dead parts, thin out dense crowns and provide adequate moisture for healthy growth. Gleosporium fungi attack redbud trees, causing all sizes of round or irregularly shaped leaf spots in tan, dark brown, red-brown, purple-brown or black. Spots often appear on leaf borders or follow vein paths. Gleosporium causes withering and early drop of leaves as well as twig cankers, according to the University of Illinois Extension. Apply a protective fungicide only if the tree appears to be in danger of severe illness. Contact a local extension agent to determine the proper course of action as fungicides are rarely effective in treating an existing infection; preventive spraying is advised. Causing leaf disease in redbud trees, phyllosticta fungi develop into an infection that manifests into round, angled or irregularly shaped spots in hues of gray, tan, dark brown or black in varying sizes. The spotted area may die, leaving a hole in its place and in extreme cases, leaves may turn yellow and fall. Black mushroom-like spots may also appear on the surface of leaves, according to the University of Illinois Extension. Only apply a fungicide in extremely severe cases. Cercospora is a fungus that infects redbud trees, causing leaf disease. Recognizable through the symptom of leaf spot, round or angled gray to brown spots of varying sizes with a dark border form on the surface of leaves. Redbud leaves may become completely brown and leaf drop may occur, according to the University of Illinois Extension. Only apply a fungicide in extremely severe cases. Verticillium wilt disease is a problem that affects redbud tree leaves. Caused by the fungus Verticillium albo-atrum that inhabits surrounding soil, the fungus invades water-carrying parts of the plant, inhibiting the transport of water from roots to leaves. In natural response, the tree blocks water carrying vessels and water movement becomes even less possible. Symptoms appear during the middle of the summer season in the form of yellowing of leaf borders; leaves eventually wilt, become completely brown and dry. Sometimes one side of the tree experiences leaf wilt while the other side appears healthy. Healthy trees are less likely to become infected by verticillium wilt fungi; keep redbud trees vigorous for disease resistance. Redbud trees infected with verticillium wilt can die within one to several seasons, according to the Purdue University Extension. Since verticillium wilt fungi live in soil, the only control method is removal of the redbud tree and replacement with a resistant plant.